The Kwita Izina Ceremony is one of the great Rwanda safari events that attract counts of travelers to undertake gorilla safaris to Rwanda. 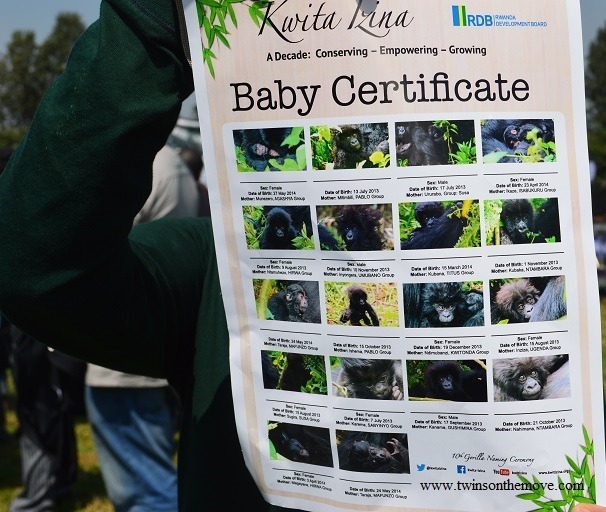 The Kwita Izina literally named as giving a name is conducted to name the newly born mountain gorillas that are known to be worldly endangered with a section of them thriving in Rwanda’s Volcanoes National Park on the slopes of the Virunga massif. The baby gorilla ceremony for naming is conducted in Rwanda every year and despite its usual happening in the middle of the year from the past times, this year it will occur on 5th September. This would go well with the travelers that have gorilla trekking safaris in Rwanda in that period. The organizers of the Kwita Izina Ceremony noted that the changes were brought about by the need to comply with the tourism vents calendar the Northern Corridor. This is according to the Tourism and Conservation Department in the Rwanda Development Board. The need to blend with the joint promotional tourism initiative in the tripartite alliance between Uganda, Rwanda and Kenya, every country has identified a flagship tourist event that would see it publicize herself to both local and the outside world individually and work towards increasing its safaris such as safaris in Uganda. The destination Kenya opted for the Magical Kenya Expo which occurs in October, Uganda opted forth June Martyrs festival while Rwanda opted for the September Kwita Izina Ceremony. And unlike the previous ceremonies, this year’s ceremony will feature a lot of aspects that have been building up to the Kwita Izina ceremony. The week of the celebration will start with a cultural ceremony focusing on the significance of cows in the traditional Rwanda and their effect on the socio– economic being of the Rwandese. This would derive diverse experience that would be beyond the gorilla naming alone and would thus offer ultimate memories to travellers on Rwanda safaris and tours.